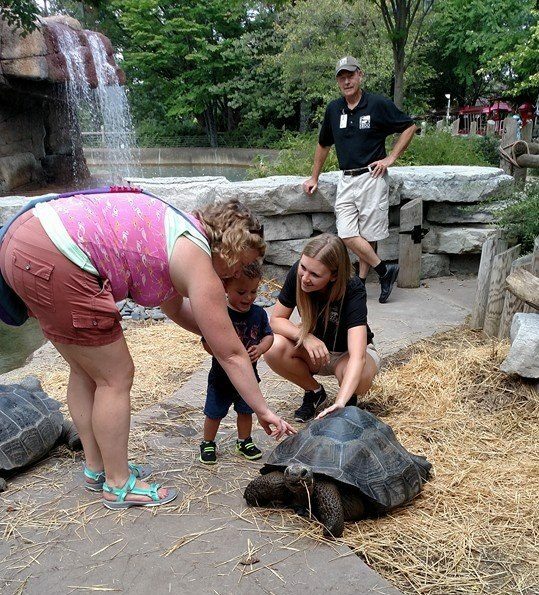 If you’ve been to the Zoo in recent years you’ve probably had an encounter of the wild kind. 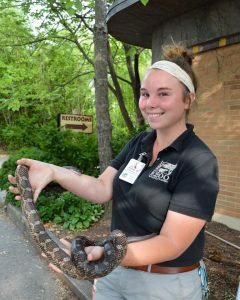 Maybe you’ve rounded a corner to find a Zoo team member holding a big ball python, ready to introduce it to you. Maybe someone has shown you how to feed lettuce to the giraffes and even snapped your photo while you did it. 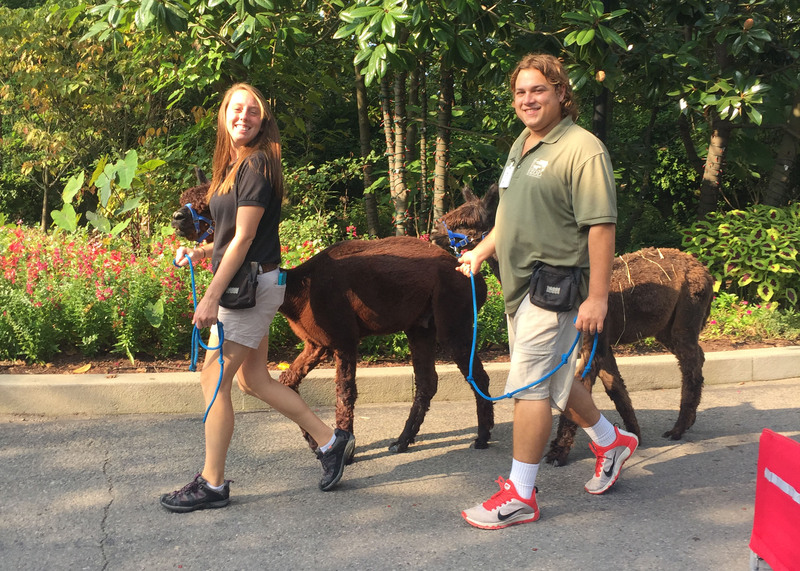 If you’ve visited the Children’s Zoo, team members greeted you and probably told you some of the goats’ names and distinct traits. Those team members were part of Wild Encounters. The Wild Encounters (WE) team strives to make zoo visitors’ days, every day, from March to October, and during Festival of Lights. Some of them are paid staff and others volunteer their time, but they all engage in similar activities each day. Their official title is Interpreter of Wild Encounters and Fun. What’s a day in the life of someone with this unique title? Glad you asked! 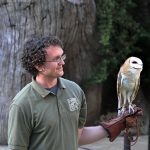 What Does Wild Encounters Do? On a given day, around 30 interpreters cross the street from employee parking, usually already chatting about the day ahead. A supervisor has carefully constructed the schedule for the day, making sure there’s a friendly face assigned for each little corner of the zoo, all day long. No one knows their schedule until they arrive, so they eagerly check to see if they’re assigned to their favorite thing. And everyone has about five favorite things! A quick morning meeting gives everyone a chance to learn what’s new that day—anything from an animal expecting a baby to the daily special at Base Camp Café. Team members give one another shout-outs for doing helpful things. It’s also a chance to share funny stories from the previous day and inspire each other. Already, a team member is waiting at Giraffe Ridge, introducing early visitors to the herd until feeding time begins. By 9:30, WE team members arrive with 16 pounds of lettuce to get things started! Meanwhile, four to six team members hit the pavement with the greater flamingos. 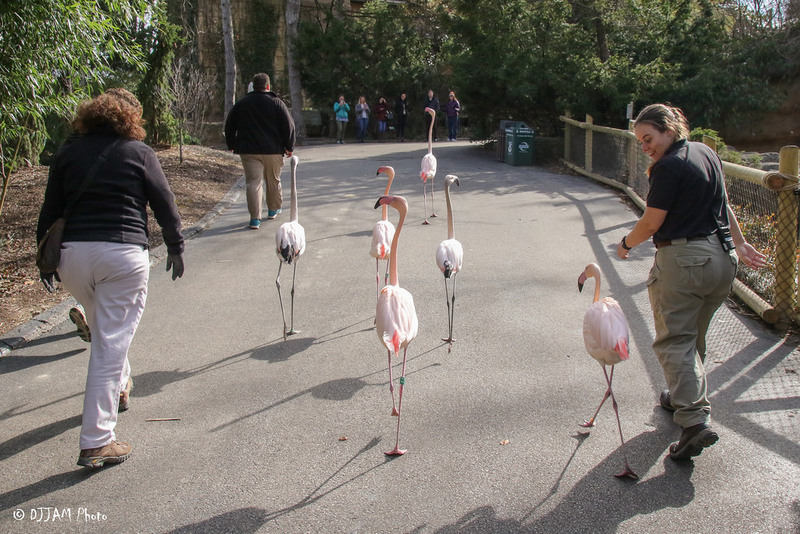 The six hand-raised flamingos gladly join with their human “flock” for a lap around the Zoo. They might stop to take a closer look at guests, honking their loud “hellos.” This time of year, the team drops off the lithe pink birds at their lagoon next to Giraffe Ridge for a day of sun and fun. Then, the interpreters head in their separate directions. Some people might be assigned an encounter. That means they get to choose an animal that they’re trained to handle and take it out to meet visitors. They carefully check the outdoor temperature to make sure it’s not too hot or cold for a given animal to be transported or handled outside. 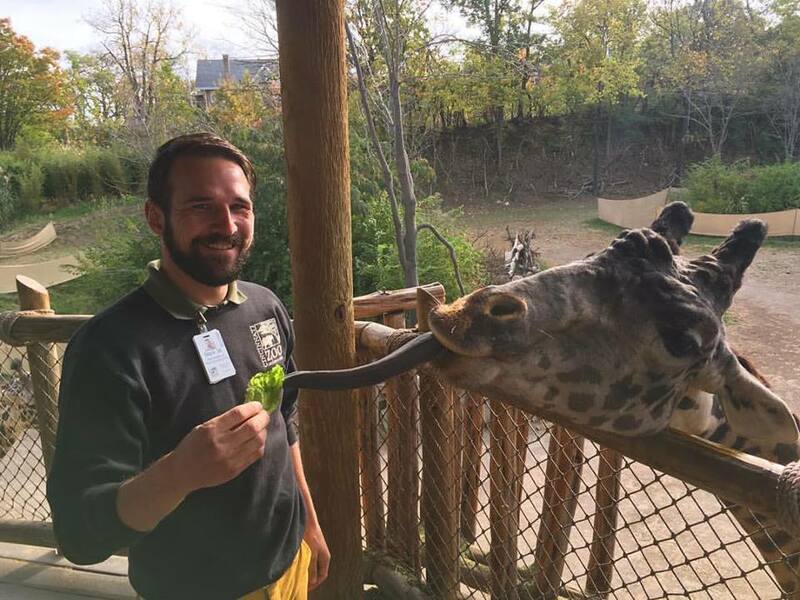 Interpreters get to know a lot of different animals, but everyone has one or two they’ve really bonded with. They might pick that one, or opt for one they’ve recently learned to handle and want to get to know better. Each person gets to their assigned spot—possibly Vine Street Village, the reptile house, Manatee Springs, or Jungle Trails. 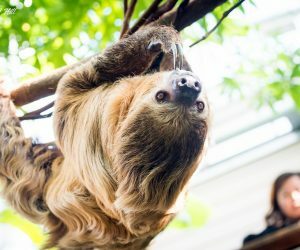 They spend half an hour to an hour introducing their animal to guests. Some guests visit a lot and know certain animals by name. Many of the kids know to touch an animal gently with one or two fingers. Other visitors are surprised or a little nervous. Some are afraid of certain animals—usually snakes—but soon see that there’s nothing to worry about. Being an interpreter means interpreting the significance of a resource—in other words, helping someone understand why it makes a difference in the world. 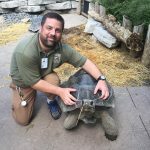 WE interpreters want people to not only have fun, but to leave knowing they hold the power to save species and positively impact the environment. Just as you’ve finished meeting a blue-tongued skink, you might turn around to see some interpreters walking by with a pair of donkeys or alpacas. They’ll gladly tell you the animals’ names and fun facts and, if the animal is comfortable, let you touch them. 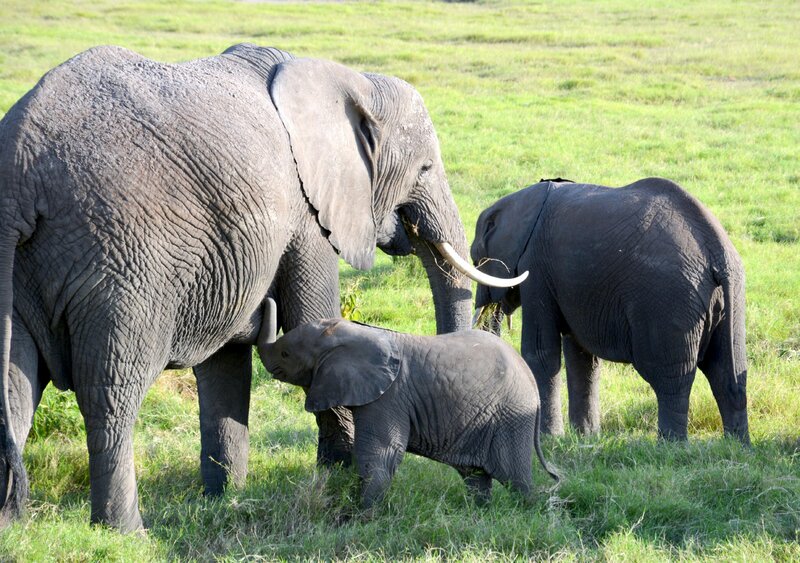 Visitor interaction and exercise provide important enrichment for these animals. Another place you’ll find WE interpreters is at the African animal encounter near the African lions. 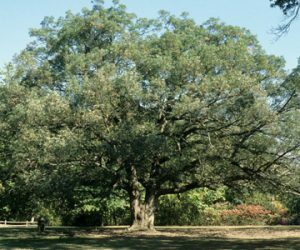 Inside the stone enclosure, you might see a tortoise, duck, owl, or something else—and it will change throughout the day. Some animals in this space are touchable, while some are fascinating just to watch. (Have you see Sheldon, the shelduck, admire himself in the mirror?) 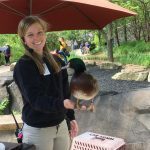 The interpreter shares information about what makes the animal special and answers your questions. A few hours in, interpreters head to their staggered lunch breaks. But even if they’re starving from pulling a huge tortoise cooler around, they’ll gladly stop to give you directions if you look lost. Whether they’ve picked up lunch from the cafe or brought it in a reusable tote, they recycle everything they can. As animal lovers, they’re an environmentally conscious bunch. They eat, catch their breath, and review the rest of the day’s schedule. They share French fries and anecdotes with equal enthusiasm. Then it’s back into the heat (or the cold, or the rain; it’s Cincinnati, after all). 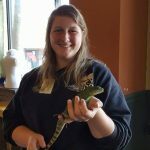 Everyone on the team is passionate about facilitating those special experiences between our visitors and the animals that live at the Zoo. WE interpreters also give many of the daily chats—for example, the polar bear, California sea lion, and hippo chats. Then there’s the goat yard in the Children’s Zoo, the Galapagos tortoise encounter, and the camel feeding. So you might see the same team member many times in the same day, all over the place. The WE day ends at 3 p.m. during the spring and fall, but lasts until 5 or 6 p.m. from Memorial Day weekend to Labor Day. When it’s over, interpreters have even more stories to tell each other. They take to social media to share with friends who had the day off. And if the day warrants it, they stop for ice cream on their way out. As you can imagine, with such a wide variety of tasks, interpreters need to learn a mountain of information and share it with a smile. 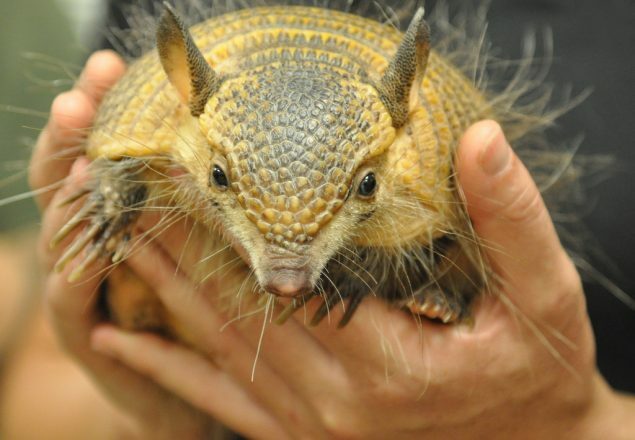 They can talk animatedly while keeping one eye on the animal in their hands. Plus, they’re ready for anything. They might call for first aid assistance if a child falls on the playground. They might have to gently remind visitors of zoo rules. They sweep up lots and lots of goat poop. Occasionally, an animal shows signs that it’s not feeling well, and the interpreter will consult with a keeper. On a truly remarkable day, they might witness a giraffe going into labor! 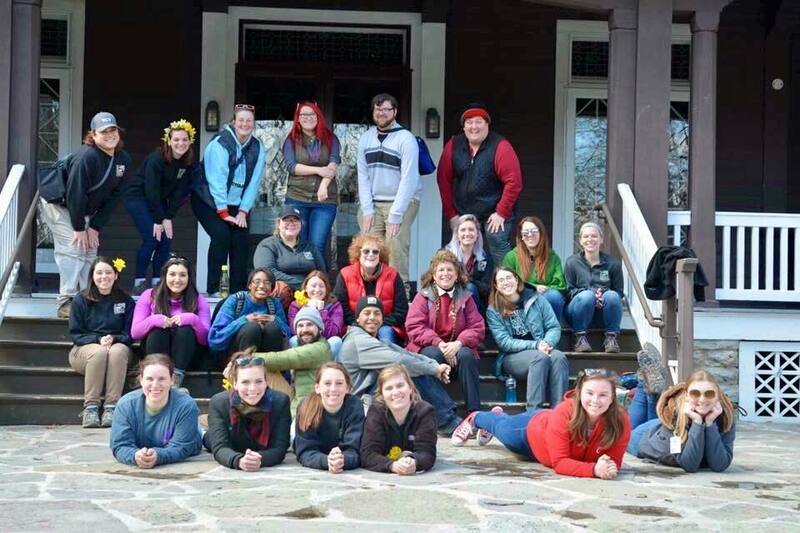 Good times and sad ones bond the Wild Encounters group. They support each other through loss, like when one of the beloved goats dies of old age. 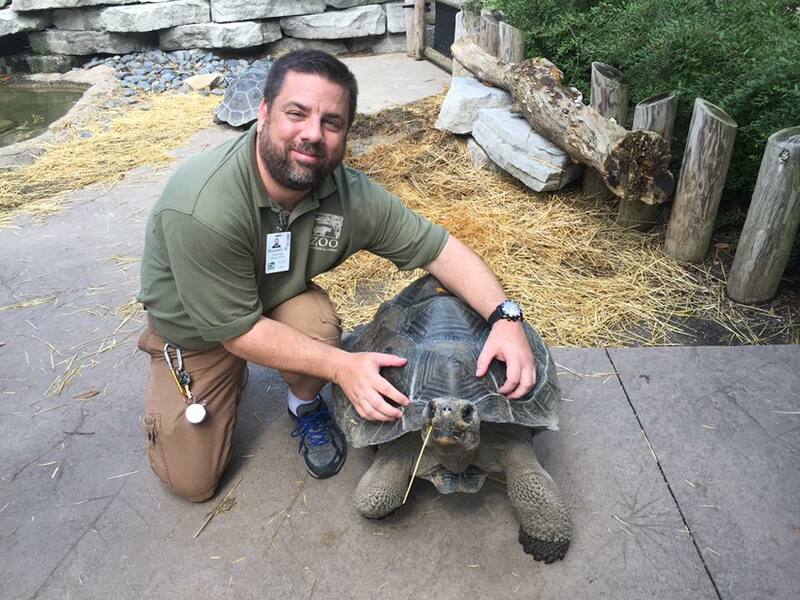 They celebrate when a team member moves onto a full-time zoo job—a goal of many people in the position. 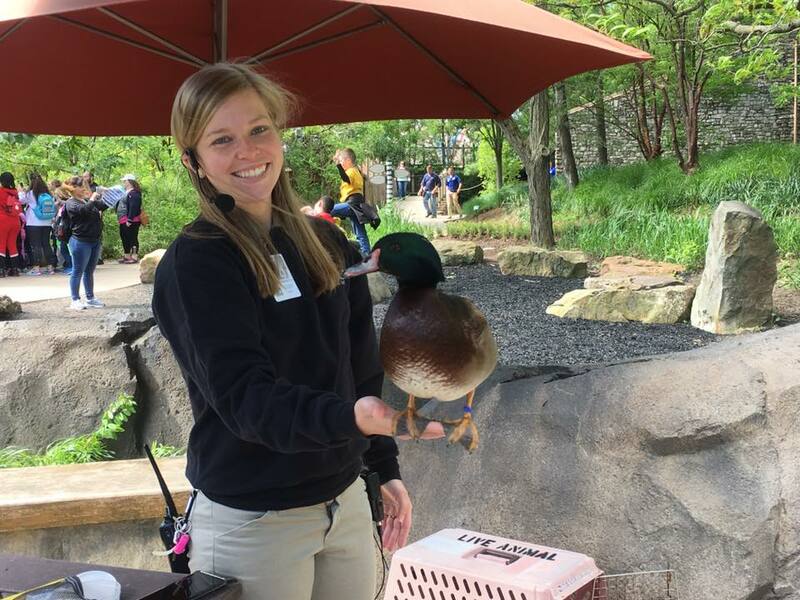 Zoo guests often approach WE interpreters and say things like, “I would love to have your job!” The truth is, it’s pretty awesome. It’s not for everyone; some people just don’t enjoy the heat, the snakes, and did I mention the goat poop? But anyone with the passion and the commitment can do it. Some volunteers put in a Saturday or Sunday as a change of pace from their Monday through Friday job. If you’re interested in volunteering, watch the website in the fall. 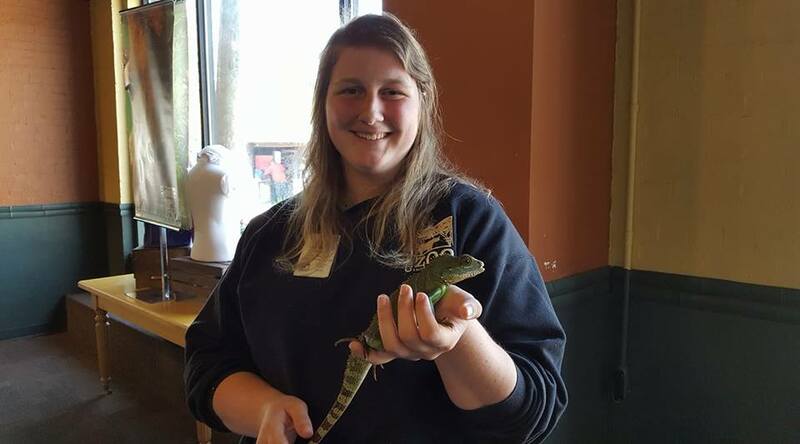 And next time you visit the zoo, be sure to say hello to a member of the Wild Encounters team and ask them about their favorite animal.